Who better to paint the picture of what life will be like as a grad student than current grad students? 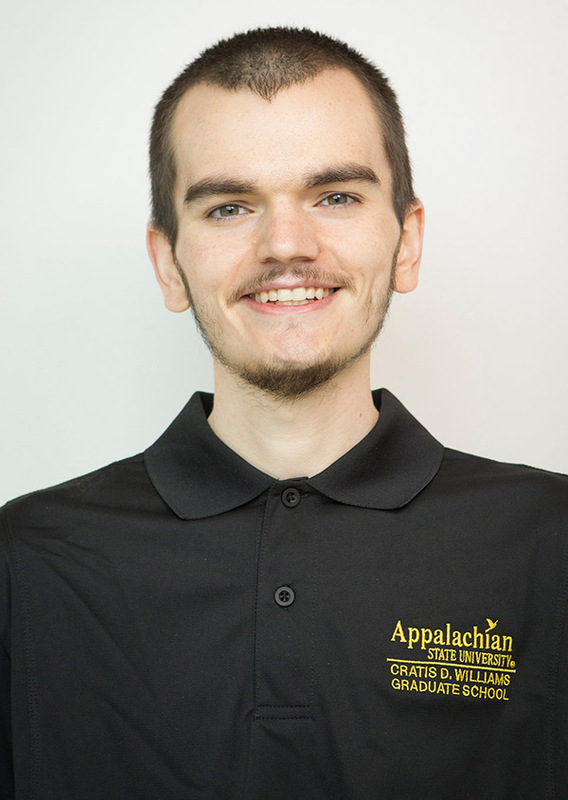 In this Masters Matter podcast, Graduate Ambassadors Luke Tunstall and Drienie Grobbelaar discuss their experiences as and as part of Appalachian's Cratis D. Williams School of Graduate Studies. Dave: Hey there, folks. It’s me, Dave Blanks from University Communications. I’m here visiting today with a couple of graduate students--but not just any grad students, I have Grad Ambassadors with me today. I have Luke Tunstall and I have Drienie Grobbelaar and you both are going to share with me your experiences as Graduate Ambassadors. Thank you so much for being with me today! Drienie: Well thank you for having us. Dave: So, what we’re going to do to start off with is just kind of get to know who we’re visiting with today. So Drienie, what are you studying right now in the grad school. What school are you in? Drienie: I am in the College of Health Sciences and I am a Nutrition Grad student and the focus of the program here at App is a focus in rural health. So that’s kind of part of the reason why I chose it. I really wanted that integrative relationship and just kind of close-knit feel of the grad school here and the program here at App. I guess a big reason about why I chose it as well is because I was an undergrad here so my professors really made a big impression on me and that played a big part in why I decided to come to App for grad school. I love it so far as a first year grad student. I am learning a lot and it’s completely different from undergrad but in a good way, and I love it. Dave: And you have an interesting background, can you tell us a little bit about it? Drienie: Yes I do! I actually only lived in the US for five years now and I am originally from Pretoria, South Africa. And that’s central to South Africa. So it’s a pretty big city. So I come from an African city and moved to a small town in America. So. That’s pretty interesting. Dave: What brought you to Appalachian? Why Appalachian State? Drienie: Well I actually transferred to App. I was looking for a really good nutrition program for my undergrad and I was looking at a bunch of different schools and I actually came to visit App. And it was actually my undergraduate tour with the Undergraduate Ambassadors that kind of changed my mind and made me fall in love with App and I just loved the idea that there’s so many smart and interesting and just inspiring people in this little small town called Boone and there’s just so much to do here. And I mean anybody who comes and visits they just know. It’s something about Boone and something about App that’s just infectious and you kind of just want to figure it out and be a part of it and just learn here. I love it and when I came to visit I already knew that I just wanted to come here. Dave: So. South Africa...Pretoria. You have really no discernible accent. So how are you pulling that off? Drienie: So I don’t know if that’s a compliment or not, I guess. Dave: I just find it very interesting! Dave: That’s what college is all about, though, right? Dave: And hopefully an even better version! Dave: Well we’re glad you chose App. And another person who chose App, our other guest, Luke Tunstall. Luke, hello! Luke: Hello, speaking of southern accents--I’m from Butner, North Carolina. Luke: Yes. It’s outside of Raleigh. Dave: Alright! Luke, what are you studying? Luke: So I am in the Mathematics Master of Arts program. It has a concentration in college teaching so it’s pretty distinct from some of the other programs here in that they allow students in the program to teach college classes on their own. So I’ve loved my experiences here and I’m developing teaching experience and learning math along the way. Dave: So where did you study your undergraduate? Luke: So I was not too far from where I grew up at UNC-Chapel Hill. So going from UNC Chapel Hill to Appalachian has been a great experience. I’ve gone from, sort of, an impersonal, “feeling like a number” experience to joining a community and feeling a lot less like a number. So I’ve loved Appalachian. Dave: So was Appalachian just a really easy choice for you or did you consider some other places? Luke: I chose App because I wanted to make sure I didn’t feel like a number anymore and I got the vibe from visiting and from e-mails back and forth with the program director that some attention would be given to me. Another option was NC State and I had a feeling that as a master’s student there--not being a PhD student--that I would have a similar experience to an undergrad. So that’s why I chose App. Dave: So you had e-mails with the head of your program? Luke: Yes, well, the e-mails and also just visiting. They take you out to lunch and things like that. So it’s been a great experience. Dave: That sounds very nice! That didn’t happen to you, Drienie? Drienie: (all laughing) No, that did not happen to me! It’s probably because I was an undergrad here. Luke: It was mellow mushroom, too. Okay, so, both of you fine grad students are also Grad Ambassadors. Isn’t that correct? Dave: Okay good, we’re all on the same page. So the Grad Ambassador program is fairly recent, correct? Luke: Right. So it actually began this past year--we’re the inaugural group. Luke: Dean Edelma Huntley, the Dean of the graduate school, actually this past summer, summer of 2014, just came up with the idea, i guess in the middle of the night, I’ve heard, she just woke up and decided, “You know what? We need a Graduate Ambassadors program here.” That’s sort of how it started. Dave: She woke up in the night. From a dream. Luke: Well, actually, I don’t want to create folklore. But I know it happened very quickly after she came up with the idea. And so her version was just to have a group similar to the Undergraduate Ambassadors or students to represent the graduate school and give tours and do things like that. Dave: Alright so that was 2014. Luke: 2014, so we’re the inaugural group of eight students. Dave: How’d you get chosen? Luke: That’s a good question. Drienie, you want to take this one? Drienie: I’m assuming it was pretty much the same for everybody. But how we got chosen was, at least for my program, students are only on campus at App for the first year. So really the only person from my program that could have been an ambassador was somebody who came from the undergrad area. So I got an e-mail from the director of the nutrition grad program. And he said that they were thinking of getting Graduate Ambassadors and running a program and it was something brand new--they didn’t know what it’s going to look like yet, or anything like that. Of course I was absolutely excited about it because, like I had mentioned earlier, the reason why I came to App was because of my tour and just because of the feel I got from the Undergraduate Ambassadors. So, we went through an interview process. It was a very interesting interview because for me it almost felt like Dr. Sanders and Dr. Huntley, they both asked us what do we want it to look like? What do we think it means to be an ambassador, and what do you think it would mean to be a graduate school ambassador and especially for a school as special as App. Because we’re not just talking about any school, we’re talking about our school and what does that mean for us and what do we want that to look like. And I mean I really had to think about it, but I just knew that, some way, if the Graduate Ambassadors could bridge the gap between the amazing faculty we have and everything the faculty does and the student who really doesn’t know, you know, where the dining hall is or doesn’t know where’s a good place to shop for groceries or to go hiking. Or just somebody to talk to that might have the type of answer that they’re looking for. Somebody who has been in their shoes and somebody who can be an easy guide to grad life at App. So I think that is what a Graduate Ambassador at App does. Dave: So Luke you just got a phone call, too? Same kind of story? Luke: The same kind of e-mail. And then I guess the graduate school informed different programs and just asked them to pick students that they thought would be a good fit. And then I had to write an essay, I don’t know if you did, Drienie, and then go through the interview. Drienie: I didn’t have to write an essay--I think it’s the South African factor. Luke: (all laughing) Oh was that it? Dave: Really helps to be from South Africa! Okay so, we already touched on the fact there are indeed Undergraduate Ambassadors already, so why have Graduate Ambassadors? I don’t know which one of you wants to handle that question--Drienie? Drienie: I think that it’s very important for any undergrad to just realize that deciding to get a master’s degree or deciding to go into a graduate program is a very, very big step. And it’s really something big, you know--it’s not just a second degree-seeking student, or still trying to figure out what you want to do. Once you get to a place where you decide to get a master’s degree, you really know what you want to do. So we’re talking about ambitious individuals. People who know what they want to do with their lives. They have a plan. So here come all these students who really are excited about their future and their lives that they’re gonna have. So you’re gonna have inquisitive students and students who want to know, “what can I get involved with and what can I be a part of at this place where I’m getting my master’s degree outside of the classroom as well?” So I think just being a Graduate Ambassador means to kind of be that voice for the graduate students on App’s campus and Luke actually told me today that we have 1800 graduate students. I mean that’s a significant number, when you look on App’s campus. And to me it just seems like they’re in undergrad but we’re here and we’re involved and we want to be involved and there are things we want to do on campus and just to have somebody out there talking about this is what you can get involved with, different charities, different organizations, different events. We also do tours like the undergraduates do. We call them “First Fridays”--they used to be the first Friday of every month, that’s why they’re called First Fridays. They’re not necessarily anymore but we do less tours than the Undergraduate Ambassadors do because all of the tours are more selective. We really try and figure out beforehand whether the students are coming to App--we do have a list, actually, of students that are coming and we know what programs they are looking at. Because when someone is looking at a Master’s program it’s not just because they want to come to App, they are looking at a specific program. So for us to best be able to paint the picture of what life is going to look like for them we need to have a little bit of insight into their program as well. Dave: How many Grad Ambassadors are there? Luke: So there are nine of us. Eight representing a diverse codjure across campus, which is important because as a graduate student, incoming, you’re not necessarily interested in the entire campus--that may sound a little bad, but you’re more interested in the department because that’s where you’re going to spend a lot of time. So it’s important to have a diverse group of Ambassadors so that they can show you, perhaps, the side of campus you’ll see more often. Where as with Undergraduate Ambassadors, they’re giving towards the students who are interested in the entire campus experience, so our diversity is pretty important. We have people ranging from, obviously, myself in mathematics to Drienie, who’s in nutrition. We have people in exercise science, biology, as well as things like social work and therapy. Dave: Okay. Well that is a very diverse group of people. So you both seem to really enjoy being graduate students and Graduate Ambassadors. What are, I guess, your days actually filled with as not only grad students but as Graduate Ambassadors? What does that look like? Luke: There are a diverse number of things that we have been chosen to do. Being an inaugural group, we’ve, as Drienie mentioned, sort of gotten to craft out what we wanted to do for our first year. So Drienie and I are probably going to have different answers to this. Luke: I actually have only done one tour so far. Most of what I’ve done has been at Graduate fairs, representing the graduate school and talking to incoming students, both freshmen as well as prospective juniors and seniors about what grad school is like. Contact tables in the student union, just having a voice to talk to students about grad school. So we’ll have a little banner, cookies, different grad school swagger [laughs] they can pick up. Drienie: I forget the cookies! Luke: So that’s the majority of what I’ve done. Dave: Okay, so you’ve just communicated, like, “man on the street” with undergrads. Dave: And do you also participate in First Fridays? Dave: Yeah. You’re juggling a lot with just grad school so you’re also getting spread a little thin in Grad Ambassadors. Drienie, what are you involved in? Drienie: See, that is definitely the unique thing about the Graduate Ambassadors program as well is that I would say it’s not as time-intensive as I would think that the Undergraduate Ambassador program is in the sense of Dr. Sanders and everybody who is involved in the Graduate Ambassador experience--they know that we are grad students. And that our first commitment is school. And our academics and what we are doing here and our research and everything. So they know that, apart from that, this is something that we get to help the graduate school with, as well, is just to be that face, to be students that our grad students and everyday students do all the the things that everyday grad students do as well. So, we get to be involved with, I guess, for me, I’ve been involved with quite a few First Fridays, I think the thing that we enjoy the most about them is that we get about five minutes or so each to kind of get up and talk to the group that day--just to kind of say our experience at App and from the first time we stepped onto App’s campus until now what has our experience been, what’s our take home, what would we like them to know about us. So, I do like that. We actually get a chance to say who we are and what App has meant to us to the potential students coming in. The other big thing that I think, as Graduate Ambassadors, that we get to do is really speak from our own personal experience. And not necessarily just the academic side of something they could go and look on a website, like, these are the dates you need to know about, this is when your application needs to be in and things like that. But really get to tell students, “This is how you will have an enriching experience at App,” and how this is just really going to add to your degree, and how to make you a more well rounded person. Boone is not small-town in the sense that you will walk away not learning something. You will meet so many different people from all walks of life and get to really focus on creating relationships and professional relationships as well. I think that’s very important. Dave: Now, you mentioned Dr. Sanders. Can you tell me who he is? Drienie: Yes. Dr. Sanders is the associate dean of the graduate school, and he is also kind of the mentor of the Graduate Ambassadors. He has just been there for everything. He’s always ready to answer any questions--very enthusiastic. He also loves the Graduate Ambassador program and everything we get to be a part of. He’s helped just create various opportunities and things that we just get to be involved with. We actually got to be involved in the commencement ceremony this semester. Dave: Oh, cool! What did you get to do for that? Drienie: We got to spend some time with the graduate students that were about to graduate that day, and we got to, you know, show them where to go and things like that. It was just an amazing experience to kind of represent the graduate school but to almost be there, cheering these graduate students on, you know, “We’re proud of you and what you’ve achieved! We’re following in your footsteps!” kind of thing. So just really creating that team environment. And again that relationship environment and those personal relationships. So it was a really cool experience. Luke: Just to plug in about Dr. Sanders--so, we had mentioned Dean Huntley had started the Graduate Ambassadors program, however, she left at the end of the summer. So, beginning of the Fall 2014, a new dean--Dean Max Poole, is our new graduate school dean, so, Dr. Sanders, have had experience during the summer actually took over as, sort of, our leader in the Graduate Ambassador experience. Dave: Well, so, the program’s still very new in its infancy, I guess you could call it. So, what do you two see, or what would you like to see, for the future of the Graduate Ambassadors program? What would you like to see future Ambassadors accomplish? Luke: I’d love to see us continuing the work that we’ve done, in the sense that we should continue giving tours, providing a voice for grad students by being visible--like I’ve mentioned, contact tables, First Fridays--as well as we’ve begun to show some leadership across campus. Some of the ambassadors have collaborated with GSAS, the Graduate Student Association Senate, to help with the local food drive, to get canned goods that would go to Hardin Park, which is a local elementary school. So doing that kind of leadership and being involved in the community is another thing that we’ll do. Giving a voice to the graduate school is important in not only recruiting new students but also just showing that we care and are involved in the community. Dave: So you’re hoping that’ll continue. Dave: Drienie, what about you? Drienie: Well one thing I really hope is that there are so many amazing clubs and programs at App for getting involved in the community and giving back to the community at App. Things like Earth Day--the food drive that just went on. Or, volunteering at the hunger coalition. Anything like that, really. But a lot of that is geared and run by undergraduate students, which is absolutely fine and I didn’t think that it’s as important to promote a whole new club for just grad students giving back, but to kind of emphasize that grad students can join these clubs as well and can be a part of the community along with undergrad students. And to remember that there are certain things that, we as grad students, do separately and do uniquely differently than undergrad students do, but also to take advantage of being part of the community here. Whether you’re an undergrad, a student, a professor--whatever it may be, but for grad students to know that there is so much that they can get involved with. And it’s not off-limits because they’re not an undergrad. Things like different clubs, I would like for grad students to know: what are those clubs? What are the things that they can get involved with on campus that are more so extracurricular activities? I would also like to see something potentially, maybe more so on the social media end, which are things that we’re working on, but social media in the way of potentially maybe a Graduate Ambassadors blog or something like that, that could be very much a question/answer type deal where incoming students could really just ask those--almost anonymous, because sometimes, not necessarily that it’s anything bad--questions that they might just be too shy to ask, like “Where can I live?” “Where are these certain amenities located?” Things like that that they might not want to ask the director of their program, you know? But maybe they would want to ask a peer. We really want to remain that face of, even though we’re Graduate Ambassadors, that doesn’t even necessarily mean a step up, it’s more “We’re your peers but we’re the people you can come to and ask these questions.” So just whatever means of communication we could create to be more readily available in potentially becoming students who have questions about App. Dave: Alright! So, Luke, if you could give a future Graduate Ambassador one piece of advice, what would it be? Luke: I would just tell them so show your enthusiasm and love for the experience that you’ve had and to make sure that you express that to others. Dave: Good advice. What about you, Drienie. Drienie: I would like to tell future Graduate Ambassadors to be a part of as much as they can, because most of the Graduate Ambassadors coming in will only be an Ambassador for a year. So to be involved in as much as you possibly can, and to remember that once grad school is over, this is kind of the legacy that you get to leave for the next students. So to envision themselves as somebody who just came into grad school and think, “What would I have liked to have been a part of?” and “What did I not know coming in?” and to really be that voice and to be that person that incoming students can talk to. Dave: Well Luke and Drienie, thank you both for your time today, I think I learned a lot about the Graduate Ambassadors program. Where can people find out more about Grad Ambassadors? Maybe online somewhere? Luke: Yeah! Just go to the grad school’s website, click on “current students,” and you’ll see more about Grad Ambassadors--the history and you’ll even see a picture of us! Not that you’d like to [laughs]. Drienie: And a little bio! Dave: Cool! Okay. So to find out more about Luke and Drienie--[all laugh]. Y’all thank you for your time, we really appreciate it. With emphasis on graduate education as a fundamental part of the University’s strategic priorities, the Cratis D. Williams School of Graduate Studies aspires to be recognized for innovative and responsive graduate programs that provide relevant academic and professional experiences for its students, preparing them for rewarding careers in the increasingly diverse communities of North Carolina, the nation, and the world. 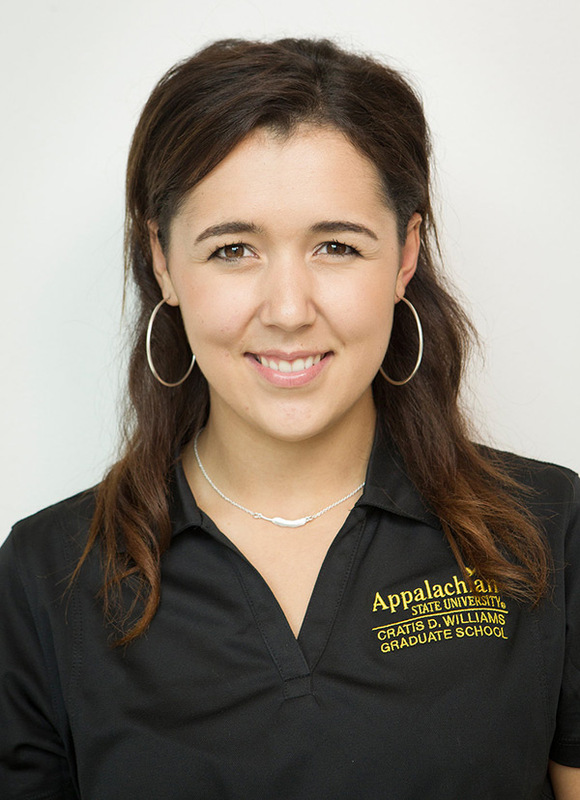 The Appalachian Graduate Student Ambassadors are a select group of outstanding graduate students who represent a range of graduate degree programs on Appalachian’s main campus. The Ambassadors support the Cratis D. Williams School of Graduate Studies by making presentations at recruitment events, leading campus tours of prospective students, participating in open house events and First Fridays, and assisting with formal Graduate School events such as awards receptions and commencement ceremonies.